While I was away in Thailand last week, I had a lovely surprise! 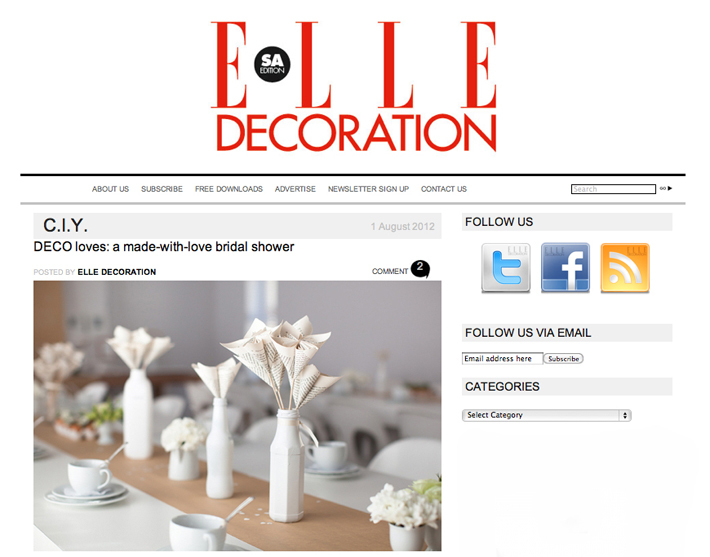 Elle Decoration, South Africa featured Lydia’s Bridal shower on their blog! Elle Decor is one of my favourite decor magazines of all time and as someone who is mad about design and decor it is a huge honour to have my work featured on such an amazing blog. If you’d like to see the post feel free to hop across and have a look here. *Lydia and Lances gorgeous white wedding was also featured on The Pretty Blog last week, if you’d like to have a look hop across here. Have yourselves a fab day gorgeous people and keep a look out for lots of colourful and fun holiday photos from my Thailand trip on the blog SOON!